With all the talk of the new Smash Bros titles and the potential new characters involved many have not taken into consideration the fact that we will be losing some veteran fighters along the way. Instead of suggesting a new potential Smash character this week, I'm going to go over the top ten characters I think should be scraped if cuts need to be made. Recent interviews with Smash Bros creator Masahiro Sakurai have given way to information regarding the roster size of the upcoming titles. It appears that even though the roster on the Wii U could be greater than that of previous Smash titles, it is going to stay in line with the 3DS version. Sakurai wanted the games to have the same library of characters and due to the 3DS' limitations it will most likely be the same size, if not smaller, than that of Super Smash Bros Brawl. 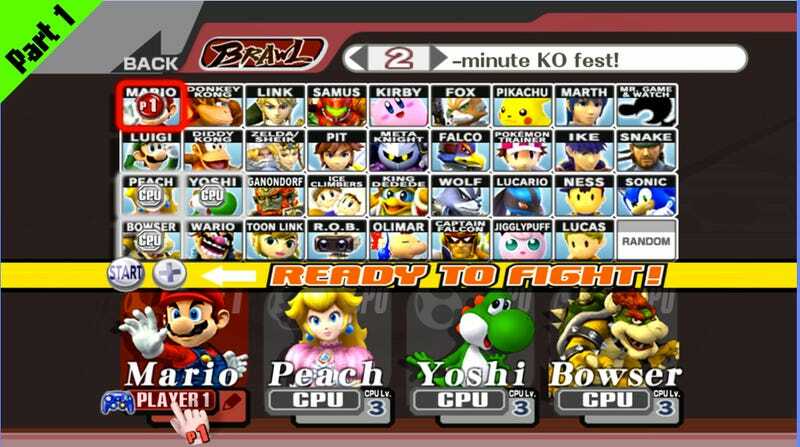 Now, if you count Pokemon Trainer as three different characters, Shiek/Zelda as two and add in Zero Suit Samus the roster for Brawl contains 39 different playable characters. Let's just pretend that Nintendo keeps it at that strange number and adds in ten newbies. That means ten characters are out! Who deserves to stay and who deserves to go? Obviously certain characters won't be picked as they have already been announced, but let's look at my first five choices for who should get the boot if push comes to shove. Keep in mind that these are simply the fighters I think Nintendo would choose, should they need to make room for newcomers. So let's count it down from ten (least likely to be cut) to six. It's hard to look through the Brawl roster and pick out characters who should stay as opposed to ones you think may not make the next cut. As much as it pains me I think Snake could very well be absent in the next Smash title. Sakurai already stated there wouldn't be many third party characters and seeing as SEGA and Nintendo just announced some new Sonic games exclusively for the 3DS and Wii U I would say Snake has a better chance of being booted than Sonic. There's still a decent chance we'll see him pop up in the newest titles, but the odds are just as good that we may have to say farewell to good ol' Snake. Ike comes from Fire Emblem, a series that features an enormous cast of characters. As the lesser known of the two Fire Emblem fighters who made it into Brawl I can see him being ousted so the newest titles could feature a new Fire Emblem hero or villain. Who knows, maybe Roy will make a comeback. Mr. G&W is a strange man/thing, and not a very popular one at that. With his two dimensional body and bizarre variety of attacks (sausages?) I can see him getting dropped form the roster to be replaced by a better know character from Nintendo's past, or maybe he's already been replaced by the somewhat odd choice of Wii Fit Trainer. Everyone loves Pokemon! Right? That's why there are six playable ones in Brawl? Pikachu and Jiggs have been there from the start and while the Pokemon Trainer's Pokemon way change I think we may have seen the last of Lucario. My best guess is that he will be replaced with a new Pokemon, perhaps the new form of Mewtwo from X and Y? Or how about Snorlax? Everyone loves Snorlax! Lucas holds a special place in my heart, as he has been one of my "mains" since Brawl hit store shelves in 2008. Though his moves are similar to Ness', it's always been my opinion that Lucas is a better brawler. Unfortunately, due to the character crunch, I can see the Smash team replacing him with a different EarthBound character (Poo?) or simply taking him out all together. EarthBound/Mother characters aren't very well known compared to others on the roster, but Lucas is even less known then Ness, seeing as he stared in the Japan only GBA release Mother 3.
Who will make my top five most likey to get booted? Check back next Wednesday to find out! Meanwhile go ahead and let me know which characters you think shouldn't be invited to the next round of Smash Bros in the comments below. As usual you can find the Challenger Approaching archives here.